In January 2008, Rural Action will welcome new Executive Director Michelle Decker. Decker’s long history with Rural Action includes involvement as a volunteer, Assistant Director, Program Director, and member. Decker was introduced to Rural Action as a volunteer in 1990, and was hired as Assistant Director in 1991. She worked directly with Rural Action founder and long-time Executive Director Carol Kuhre for five years. After taking two years to earn a masters degree in Urban and Regional Planning with a focus on Community Development from the University of Wisconsin, Decker returned to Rural Action and worked as a Program Director until 1998, when she relocated to Baltimore, Maryland. In Maryland, Decker has gained considerable experience in building non-profit organizations. In the ten years Decker spent away from Ohio, she worked with community development organizations engaging in housing development, neighborhood revitalization, and statewide policy. Decker is currently Network Coordinator for the Maryland Asset Building Community Development Network. When the Executive Director position at Rural Action became available in spring of 2007, Decker was immediately interested in returning to Southeast Ohio to be part of what she says is “a rare organization: a membership-driven, very local group working on sustainable development,” which Decker has believed in since the beginning. “The values that formed Rural Action are all still there,” Decker said. As Executive Director, Decker hopes to focus on growth in the years to come, nurturing Rural Action's membership, its VISTA National Service program, and working with partners to create valuable social enterprises. “Rural Action has done so much, in partnership with so many. We will continue to build excellent sustainable development programs that serve the region and its future generations,” Decker said. 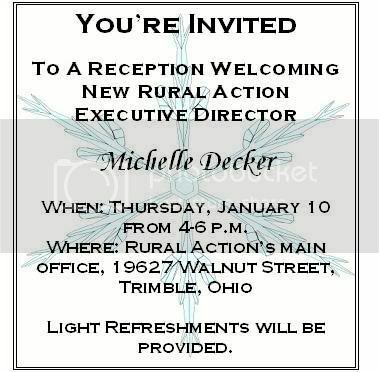 A Welcoming Reception will be held on Thursday, January 10 from 4-6 p.m. at Rural Action’s main office on Walnut Street in Trimble, Ohio. Light refreshments will be provided, and all are welcome to celebrate Decker’s arrival and meet other staff and volunteers. More than 150 people gathered in Athens to share a breakfast of local food, hear about the work of Rural Action, and help support that work through donations. For the third year, Wil Chandler of Athens Realty, sponsored the event, allowing us to use all of the donations and pledges directly for Rural Action programs. 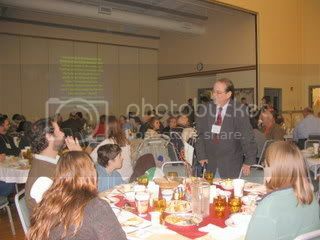 Matt Reese provided background music as guests arrived, a wonderful touch on a gray November morning. Kelsey McCoy, Media VISTA, did an excellent job of leading us through the various parts of the hour-long presentation. We heard from the Reverend Bill Carroll, pastor of the Episcopal Church of the Good Shepherd, Sara Sigman a Youth Act member and student at Alexander Middle School, and Bob Fedyski, Sustainable Agriculture VISTA who sourced many of the ingredients for the meal from local producers. Current VISTAs spoke briefly about their work during my presentation when I spoke about the history of the organization and my connection to that history, current programming and future directions. Mary Anne Flournoy, Chair of our Board of Directors, gave a passionate talk about investing in local grassroots work that reaps huge benefits for our region, but largely goes unnoticed, and invited everyone to invest in that work. And people responded to that message in very significant ways. Thanks to all who led this effort and the incredible work of Tori Patterson, VISTA leader, who worked tirelessly to organize the event and kept everyone on task throughout the months of planning leading up to the 15th. Thanks all of the people who invited friends and colleagues to the breakfast, and thanks to all the donors who gave selflessly when asked to support this vital organization. Final totals are not available, since some pledges and donations are still coming in. But we can report that many new names have been added to the donor list, and we have received some donations from the wish list. Again, a sincere thank you to everyone who participated and for the tremendous support shown for this organization and its work. It will continue! We’d like to thank all Giving Society members for their investment in our work, both now and for years to come. 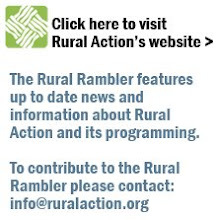 For more information about the Rural Action Giving Society, contact Tori Patterson. October and November are beautiful months to drive through West Virginia. Mike Steinmaus (Monday Creek Restoration Project) and I spent two weekends in our neighboring state talking about Rural Action’s approach to sustainable development in coal country. In October we met 25 VISTAs who are working in the northern Appalachian coal fields, and in November we met an additional 25 working in the southern coal fields. Our presentation covered every part of Rural Action’s story, from its beginnings in the 1980s as the Appalachian Ohio Public Interest Campaign to its present work in forestry, agriculture, watersheds and community development. 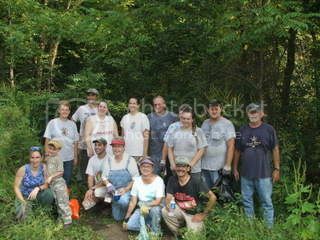 The people we met make up the Appalachian Coal Country Watershed Team (ACCWT); they are seeking to mobilize communities to care about their watersheds and the future of the region, as well as work to clean up the streams. Questions dealt with funding and how we raise dollars, but also about community organizing and identifying emerging leaders in the watersheds. The Eastern Coal Regional Roundtable (ECRR), a network of watershed groups in the Appalachian coal fields, was recently awarded a USEPA Targeted Watershed Grant. During the next two years, Rural Action will be working with ECRR and other regional partners to design and implement capacity building training programs for the groups and VISTAs that make up the ACCWT. Appalachian Ohio Alliance (AOA) recently acquired a 1,200-acre tract of hardwood forest in Northern Athens County from the Sunday Creek Coal Company. The property known as “Taylor Ridge” will be officially named the Trimble Township Community Forest in recognition of Trimble Township and its residents. Thanks to our partner - the Ohio Department of Natural Resources (ODNR), Division of Wildlife - who contributed the required 25% matching funds, we successfully obtained a grant through the Ohio Department of Public Works’ Clean Ohio Fund. This grant provided the remaining 75% of the seller’s price, allowing us to complete the purchase. Local residents helped make this project a success by voicing their desire to conserve wildlife habitat and provide for public lands. This large parcel of habitat will help to connect the Wayne National Forest with the Trimble Wildlife area. AOA has established a local citizens’ land management committee for the Community Forest that meets monthly at the Sunday Creek Watershed office, in Glouster. This land will then be managed with the assistance of ODNR’s Division of Wildlife as a Wildlife Area. The preserve is open to the public for hiking and hunting, and will remain as such in perpetuity. The land management committee hit the ground running on August 25 by cleaning up the illegal dumpsite located at the entrance of the Community Forest just off of Derthic Road. A crew of 25 spent the morning cleaning up 13 cubic yards of trash, construction material, and approximately 40 tires. A group of adjacent landowners and committee members are relocating the gate closer to the road. This will prevent illegal dumpers from pulling off into the woods and conveniently dumping out of sight. In addition to the illegal dumping project the land management committee is working with Trimble High School to adopt the Community Forest as their Land Lab. Principal Heinsley and the science teachers have shown their interest in the Land Lab by allowing a group of approximately 30 interested students to meet with committee members once a month. In October the students were asked to brainstorm ideas that they had for the Land Lab. Having a Land Lab for the Trimble High School students to develop and foster is a huge asset for the community. The 1,200 acre Forest is an ecologically diverse tract of land that will provide equally diverse educational opportunities: from installing and monitoring duck and blue bird boxes, to photography and journalism pieces detailing the Land Lab’s progress. A great deal of cooperation and teamwork between Trimble High School, local residents, AOA and the Sunday Creek Watershed Group has occurred to get this project started. We appreciate the energy that the Land Lab project has developed in the community and look forward to the future Trimble High School Land Lab. For more information regarding the Trimble Township Community Forest or the Trimble High School Land Lab please contact Kaabe Shaw at 740-767-2225 or visit the Hocking Hills Land Trust website. Charleston, West Virginia, was the site of a convening called Building Sustainable Economies in a Shrinking World. The eight organizations that make up the Central Appalachian Network (CAN), including Rural Action, spent months planning the two-day forum. Its purpose was to bring together experts in sustainable development as well as national leaders among philanthropic organizations, socially responsible investors, policy makers, and sustainable development practitioners, tell the story of the CAN organizations and our impact on poverty and sustainability of the region, and solicit long-term investment from attending funders. CAN members shared experiences building and applying a diverse array of environmentally sustainable development strategies with proven impacts that ranged from a local to a regional scale. We outlined what kind of investment needed to be in place in order to scale up our work and meet the critical development needs of the region. The participants helped us think about ways we could do that and shared their experiences as well. A publication follows that will outline the results of the convening and meetings were set to continue the conversation. CAN members will meet in January to continue the work begun in November and to continue to build CAN’s presence as a regional leader. River Rally to be held in Ohio! Scholarships from the Ohio Department of Natural Resources and River Network may be available. To learn more, visit the River Rally website or call the Huff Run office, 330-859-1050.